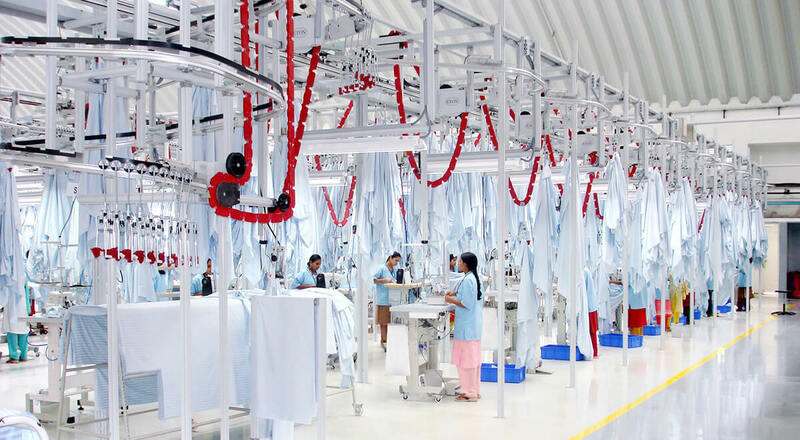 The Eton system for Home Textile industries is a flexible material handling system designed to eliminate manual transportation and minimise handling. It increases productivity radically, ensures an optimal working flow, and provides time for adding value to your products. The Eton system transports all the pieces of one complete product through the manufacturing process. An addressable product carrier takes all the pieces of one entire unit (i.e. for mattresses – panels, borders,, zippers etc.) through the different steps of production. Operations are performed at individual workstations. The end result is a cost-efficient product, processed from pieces to completion. With a very active R&D department and knowledge from more than 4000 system installations in more than 60 countries it is safe to say that Eton is a partner you can rely on. Support & future upgrades – select a reliable supplier with a track record of constantly improving products and supporting their customers Flexibility – protect your investment by choosing a supplier with a modular approach that will allow your system to grow as your business grows, don’t get boxed in.